Pressing of cased-in books and simultaneous burning-in of the JOINTS for forming perfect hinge and permanent shape with the help of temperature-controlled pressure blades (Joint Forming Bars) for Flat or Rounded Spine of Book-Blocks. These blades are spring loaded for adjusting to different depth of joints automatically and hydraulic pressure can be set from 100-300/400kgs to achieve the desired results. The bars (Joint Formers) are supplied for Flat and Rounded Spine Book-backs respectively. 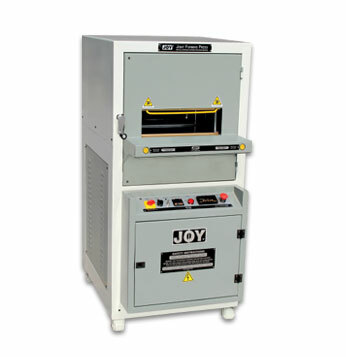 Temperature of the Joint Formers is set through Digital Temperature Controller (PID) to suit properties of Glue (Adhesive), Binding material and operating speed. The PLC (Programmable Logic Controller) enables choice of single or multiple stroke/s for accurate control of burning-in the Joints and consistent results. Counter on PLC indicates number of books processed at the end of each cycle. The system automatically releases the book on completion of the set timing cycle. Back-gauge (setting handle mounted on the front panel) is provided for faster make-ready / production; Light Guide indicates the Joint Forming position and also reduces the make-ready time. Specially designed operator Safety Device in addition to Emergency Switch incorporated. Provision for Joint Forming of foam padded cases available. PLC based control panel for optimum reliability and simplified diagnostics. Press equipped with Castors for maximum space saving / utilisation.